P1010585, originally uploaded by Mic2006. One of the more exciting events of my rock-related year is the Bancroft Gemboree where i can schmoose with other rock-focused people. You absolutely know that this weekend the accommodation in Bancroft and for miles around will be booked solid so either I will be staying with my sister or possibly in Peterborough. 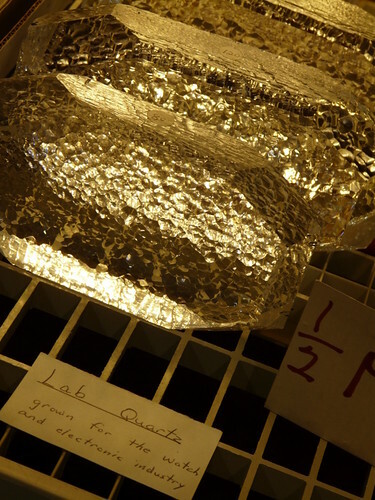 At the Bancroft Gemboree there is every natural crystal from the beautiful to bizarre – a booth of Columbian emeralds, Pakistani Peridot dealers and Russian fellow who sells black power pyramids of some unnamed substance. You stand there long enough he’ll have you convinced to put one in your living room – an investment that will turn your life around. Well if you believe that crystals will heal your warts, you’re well advised to see him as you’re likely thinking along similar lines. I’ll get a picture if he’s there this year and see what he has to say. If you are into crafting, beading, crystals or geology, or just looking for gems, rough or cut, the Bancroft Gemboree is an event that goes beyond the material presentation of those goods, it’s a cultural event that bonds a motley crowd of locals to a throng of rockhound and crafting visitors. There are two huge venues, though I have always found that the better gem-stuff is in the venue lower down the hill. The best deals at the gemboree are typically outside at the top of the hill though last year I was disappointed. Maybe next year I’ll get a booth and flog my upcoming Ontario cave book there. gemboree1 027, originally uploaded by Mic2006. Rock enthusiasts of Ontario and surrounding regions – it is now less than a month to go before the Bancroft Gemboree. I try and make a point of attending each year as does my wife Maggie. 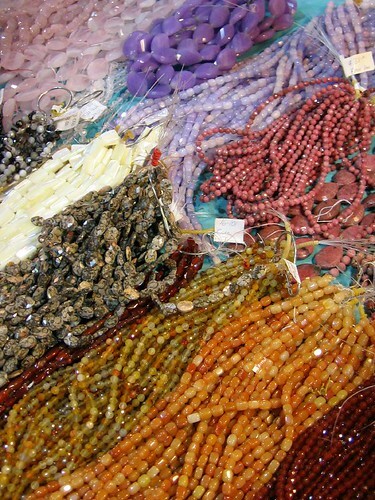 One of the trends that I see emerging at the gemboree is its increasing focus on semi precious beads. Beads have a long and fascinating history; they were amongst the first forms of adornment and also, because of their value, experts soon found a way to make simulations – the Romans were experts at various cleverly crafted fakes. Myans and Olmecs were big on beads. In having visited the Jade Museum in San Jose we saw some amazing examples. Because of the labour involved in crafting beads of nephrite and other tough materials the bigger the bead found at a burial, the more important the person is assumed to have been. ” Himalayan shepherds sometimes find etched agate beads lying in their fields. The cultural origins are unknown, though the finds are considered a good omen as the bead is thought to be a talisman that will protect its wearer from disaster. Known as dZi beads, they are believed by locals to be petrified insects, or possibly beads that the gods had dropped due to their imperfection. Very few are found in perfect condition and in light of their supposed insectivorous nature, dust must first be thrown over the bead if you are to capture it in your hand. To simply grab it without the “dust tossing precaution” means that you risk the possibility of it wriggling away”. If beads interest you , consider checking out Maggie’s online bead shop at http://www.maggiebeads.etsy.com – she sells various beading kits and ships within 1 working day.